Originally, the Philly Cheeseteak was made with just the steak and onions, but gradually Pat added cheese. Later variations also included vegetables such as bell peppers and mushrooms. The new sandwich became such a hit that it enabled Pat to open up a restaurant of his own where he entertained such celebrities as The Three Stooges, Tony Bennett, Humphrey Bogart, and several U.S. presidents. 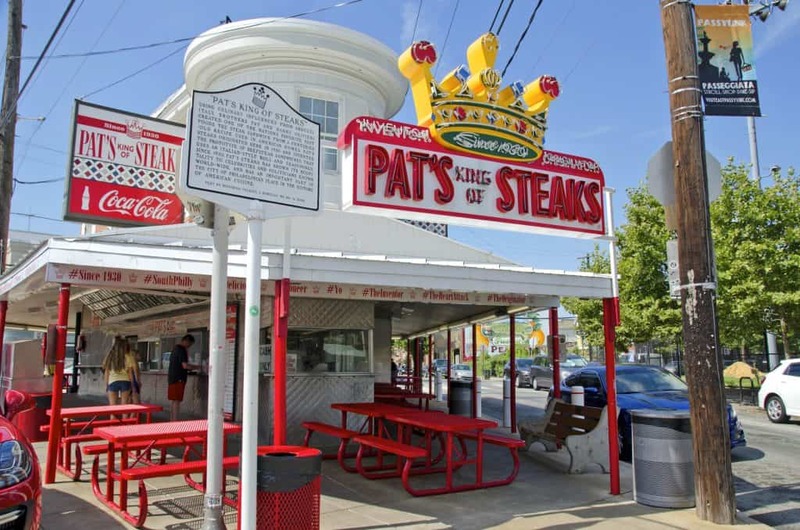 It’s still in operation today, Pat’s King of Steaks, and it still packs a crowd. I love rolls that are crispy on the outside and soft on the inside. Particularly when they’re filled with savory, tender slices of steak, onions, bell peppers, mushrooms, and oozing with cheese. Imagine biting through all of those layers… Now grab those ingredients and make your own Philly Cheesesteaks right at home! And, if you like, eat them while watching “Rocky,” another Philly original. Season the beef strips with salt, pepper, garlic powder and onion powder. Heat the oil in a medium skillet on medium-high heat and sauté the beef strips on both sides until done, about 3-4 minutes. Transfer the beef strips to a plate and tent with aluminum foil to keep warm. Add the onion and bell peppers to the pan, season with salt and pepper and an extra pinch of garlic powder and onion powder. Sauté until crisp tender, about 3-4 minutes. Transfer to plate. Add the mushrooms (add some oil if needed), season with salt and pepper, and sauté until golden, about 5 minutes. Spread each side of the hoagie rolls with some mayonnaise. Layer the beef on bottom halves, and top with onions, bell peppers, and mushrooms. Lay two slices of cheese on top of each hoagie. Place the top of the hoagie rolls on top. Preheat the oven to 400 degrees F and heat the Philly Cheese Steaks just until the cheese is melted, about 2 minutes. I’m so hungry now! :-) Thank you for the interesting and lovely story. 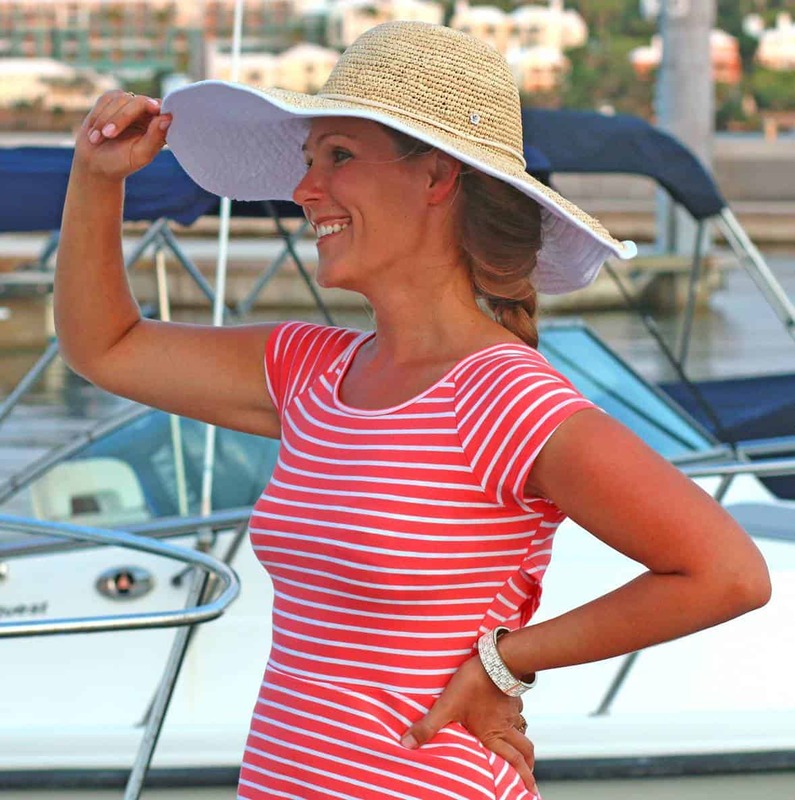 I love your stories that accompany your fantastic recipes.I have tried several of your recipes and find them easy to follow and taste delicious. Don’t forget Geno’s across the street from Pat’s in Philly. Both are always packed and serve outstanding steaks. 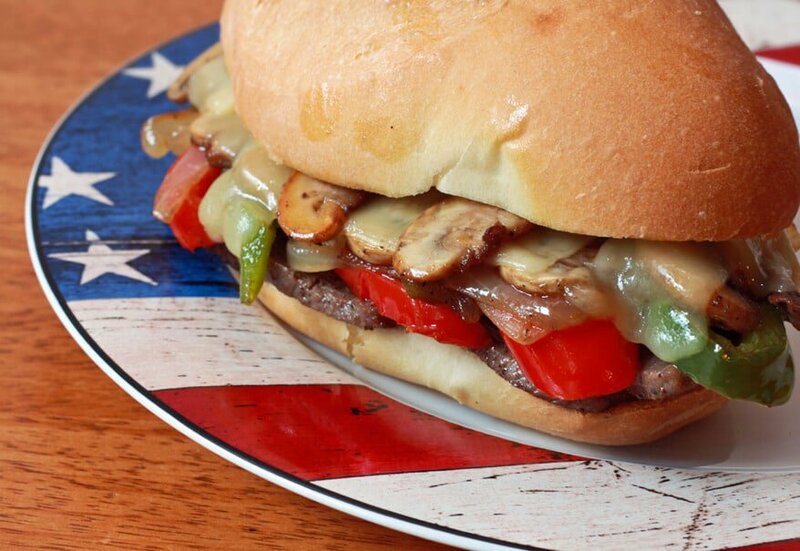 These days a “real” Philly steak is made with cheese wiz but the recipe above sounds delicious.